Wired shelves, standard chrome plated metal. Solid shelves, standard made of stainless steel. Electrical continuity between all parts. ESD castors 125mm (100kg/weight per castor). Maximum weight per shelf 250kg. 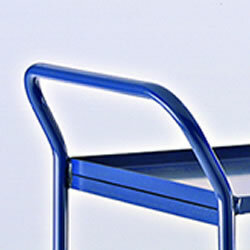 Shelf height is adjustable every 2.5cm.